Hamas said it will increase its launching of incendiary balloons during the day this week. The “night unit” of Hamas in the Gaza Strip announced on Saturday that it will escalate its protests near the security fence, according to a report in Haaretz. The unit released a statement announcing that its members will operate near Israel’s southern border from 7:00p.m. to early morning this week and will also increase its launching of incendiary balloons during the day. Ministry spokesman Ashraf al-Qudra told the news agency the two men, aged 18 and 29, were shot in separate incidents along the fractious border. The IDF did not comment on the deaths but said “approximately 9,500 rioters and demonstrators” gathered in various locations, “hurling explosive devices, hard objects and rocks” at troops. Troops were “firing in accordance with standard operating procedures,” an IDF spokeswoman said. The weekly “March of the Return” border riots have been going on every week since March 30, 2018, and will mark their first anniversary next week. The border riots in the past included Gazans attempting to infiltrate into Israel, as well as using kites and balloons with explosives attached in order to set fire to Israeli property. 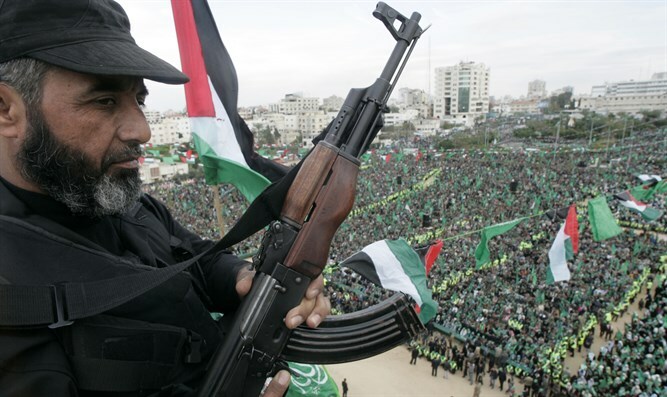 Hamas has openly admitted that most of the Gazans who have been killed in the border riots were members of the group. ARAB OCCUPIERS " NOT Palestinians, an Arab creation post 1967.